Edinburgh University head coach Dorian Ogunro felt his side played the better football during their 3-0 defeat to table-toppers East Kilbride at a rain-sodden K-Park. The Students acquitted themselves well for large spells of the contest against the runaway league leaders and Ogunro admits there were plenty of positives to take from his team’s display. It has been just over three months since the University last tasted victory, but there were signs during this match that a long-awaited three points could be just around the corner. “If we play like that every week, we could beat most teams in the league,” stated an upbeat Ogunro. “They were poor goals to concede but, up until East Kilbride scored their second goal, we nullified their attacking threat very well. “They spent the majority of the first 45 minutes cramped inside their own half and we were moving the ball around the park nicely. “The second goal was the killer for us. The boys felt it was offside, but their keeper has made a great initial save. We’ve then switched off and their player has a simple tap-in. “I thought we played really well up until that point and the players can take heart from that defeat. We never looked outclassed at any stage and I felt we were actually a bit better on the ball at times. “We lack that cutting edge in the final third because we don’t have a striker just now that can hit double figures. “It was always going to be a tough challenge to come to K-Park and expect to win, knowing the resources they have. Former Inverness and Dundee United centre-back David Proctor opened the scoring against the run of play after 24 minutes following a bright start from the visitors. The defender’s lung-bursting run into the box wasn’t tracked by a Uni jersey and winger Paul Woods cut the ball back from the by-line for Proctor to slide past the keeper into the bottom right-hand corner. That goal arrived after full-back Max Condie, who scored during the 2-2 draw against BSC Glasgow the previous week, blazed narrowly wide from long-range. East Kilbride began to get a grip hold on the game as the rain continued to thunder down, making the artificial surface slippery and challenging for both sides. The Uni were hit with a double suckerpunch just before the interval. Cammy Russell’s shot from outside the box was tipped behind by Mark Tait after 41 minutes and from the resulting corner unmarked defender Proctor was allowed time and space to bullet a header into the net. Skipper Craig Malcolm made it 3-0 just two minutes later with a powerful shot from the edge of the box which flew past the keeper. To their credit, the students responded well in the second half with Lewis Hendry’s effort blocked on the line following a goalmouth scramble just beyond the hour mark. Santeri Kuivalainen then came within a matter of inches from turning home Luke Murray’s in-swinging cross. Elsewhere, Whitehill Welfare’s hopes of avoiding finishing bottom of the table faded further as they suffered a 6-1 defeat against Kelty Hearts at New Central Park. Ian Little’s side had no answer to the big-spending Fifers’ firepower, with Kevin Keane netting a second-half consolation for the Rosewell outfit. 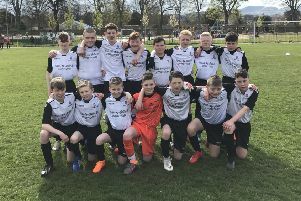 Civil Service Strollers edged a seven-goal thriller against Dalbeattie Star at Islecroft, with Jordan Hopkinson, Craig Newalls, Scott Clapperton and Ross Guthrie all on target for the Capital side. Spartans kept their fourth consecutive domestic clean sheet after beating Gala Fairydean Rovers 2-0 at Ainslie Park on Friday night thanks to goals by Blair Tolmie and Jack Smith.